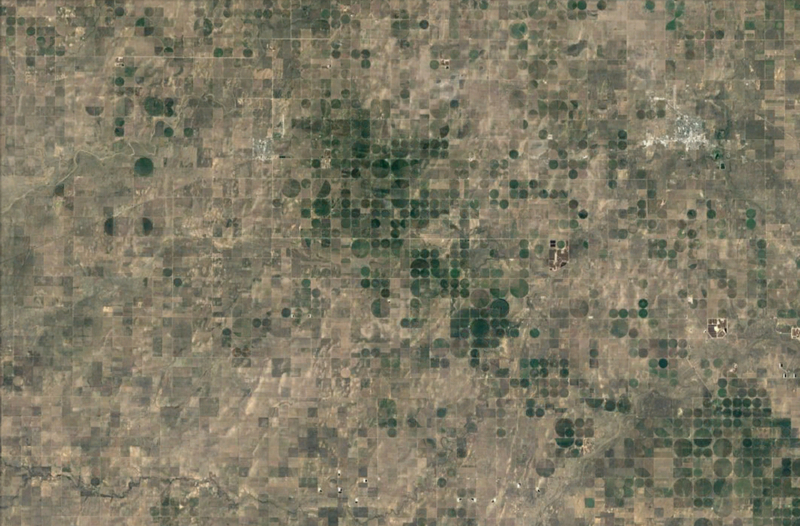 SearchReSearch: Answer: How many center-pivot irrigation systems do you see? How DO you count so many center-pivot systems? We started last week's Challenge with two satellite images. 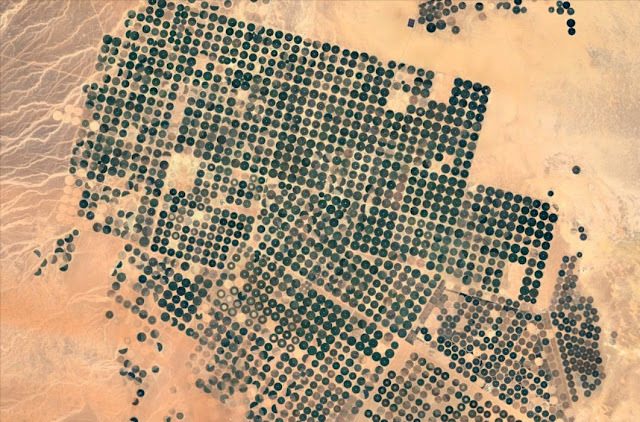 The first is from a large center-pivot farm at 29.9653127, 38.3618227 in the northern part of Saudi Arabia. 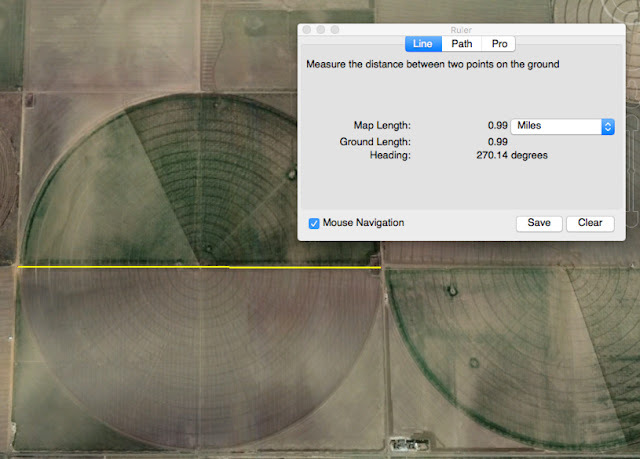 There are LOTS of differences, but let's use Google Earth to do some quick measures. Just how big are these things? Notice that almost all of the center-pivot systems in Saudi Arabia are almost exactly the same size. What IS that size? By jumping to that location in Google Earth and using the measurement tool, we see that they're exactly 1 kilometer across. 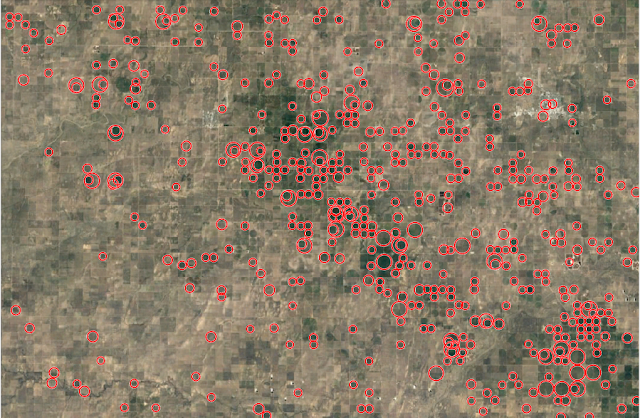 Interestingly, in the US, the circles come in two sizes, large and small. Want to guess what their diameters are? Both are in fairly flat (easier to build the irrigation systems) and dry (so they really need irrigation) locations. Both happen to be near borders with other states (or countries), and both are near cities and decent transportation systems. I pondered this Challenge for a while before realizing that counting by hand is one solution. And you could do that. But I was thinking about what might be a more general solution... suppose we wanted to count all of the center-pivot irrigation systems in all of Kansas or all of Saudi Arabia? Counting by hand would be a bit tedious and error prone. What would Dan do? I'd search for a tool to help out. 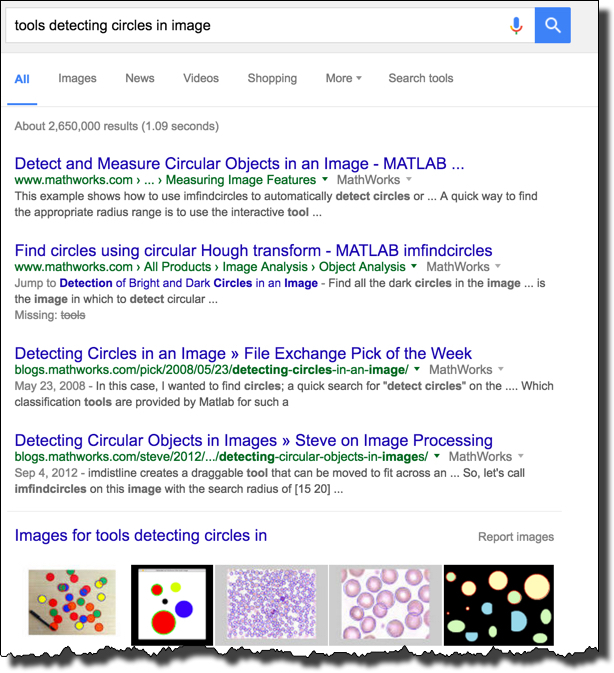 I started reading the first link here about how to detect circles in images by using the Matlab system. Background: Matlab is a system that lets you do math, graphics, image analysis, and programming all in one package. It's a product of Mathworks and can be incredibly handy when you have a task that requires you doing some kinds of analysis. I have no affiliation with them--this just happened to be the tool that I found. 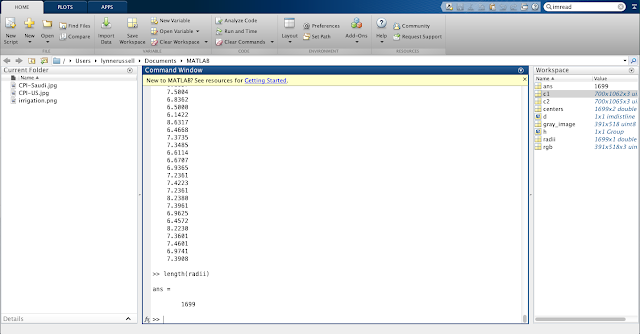 As luck would have it, Matlab has a fantastic "try it out for 30 days" evaluation mode. (THANKS, Mathworks! This is awesome!) I definitely wanted to test it out, so I downloaded the package onto my Mac laptop and started following the directions in the article. Based on the article, I was able to copy their code and adapt it to our purposes. 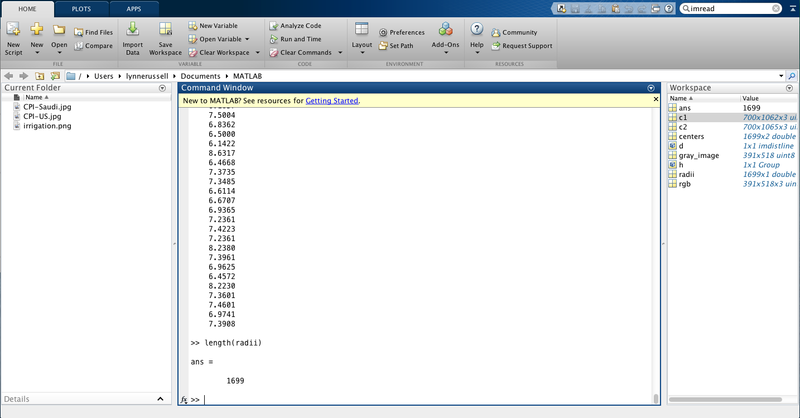 This is what Matlab looks like in operation. This is just after I'd run my code (in the center window) and it's telling me the number of circles it found in the image. 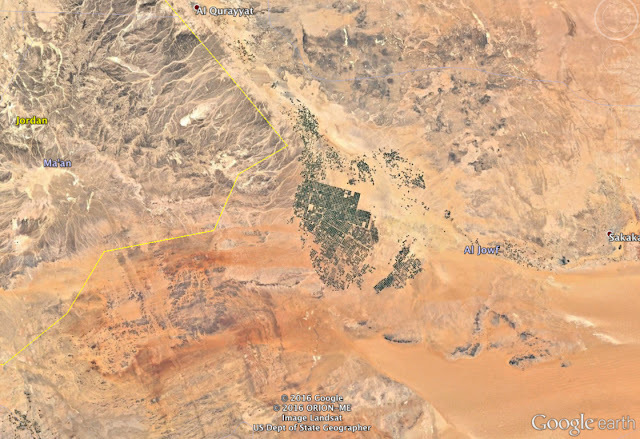 Here's the way it works: You write a few lines of code (see below), and run it over an image, in our case, the pictures of the Saudi and the US irrigation locations. The code looks at the image and tries to find as many circles in the image as possible. % how many circles did this code find? The only work I really needed to do was to figure out the size of the circles (in pixels) and then play around with the sensitivity parameter until it found all of the circles that I saw in the image, and didn't hallucinate anything. Basically, the 'Sensitivity' value tells the program how much to amplify the difference in the colors in the image. If the difference between adjacent pixels is small, it will make that more apparent in the image. It's a bit like turning up the volume on the ability of the program to make distinctions. Here are my notes as I was playing with the system. 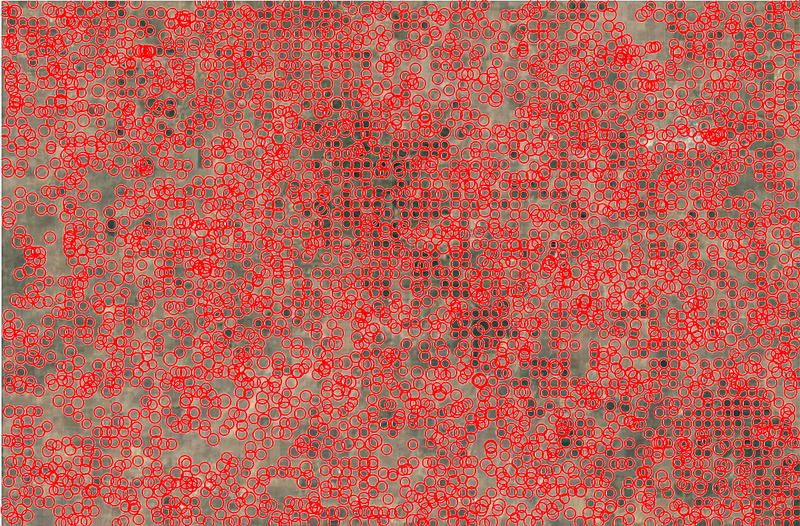 The number (0.99, etc) is the Sensitivity parameter, and the integer next it is the number of circles it found. But at 0.96 it finds most of the small circles (it finds 456, while missing a few), but it also misses ALL of the larger circles. If you look at this image carefully, you'll see it's undercounting by just a bit. (It misses around 20 small circles and 5 large ones.) And if you look at the misses, it's often because the circle is barely visible. 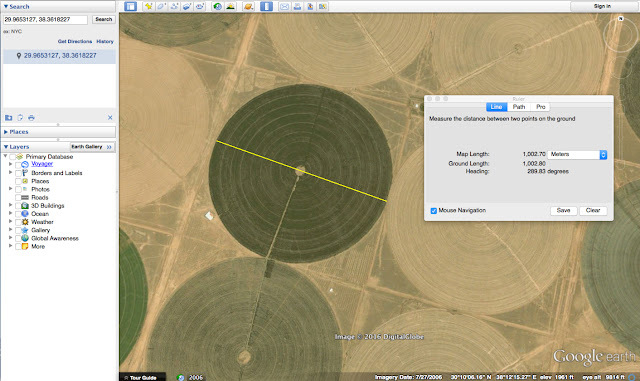 Is it a center-pivot irrigation system that is out-of-operation? As with many of the Challenges, we have to define our question carefully--and implicitly, what our answer will be as well. In this case, we've used a program to find around 500 center-pivot irrigation systems. With a bit more tuning (and futzing around with the image contrast) we could probably find a few more--but this was about 30 minutes of work on my part, and the accuracy is pretty good. This becomes ever more evident when you look at the center-pivot farms in Saudi Arabia. We're missing a few (especially at the bottom--fields that are out of commission? ), and we seem to be hallucinating a few on the left. Here, the overcount is close to the undercount, so we'll accept the number of circles found as being close to the actual number--in this case, the program found 1699 circles. 1. Use the tools at hand to get a quick overview. In our case, using Google Earth's ruler tool let us find that the center-pivot systems in Saudi Arabia are metric. 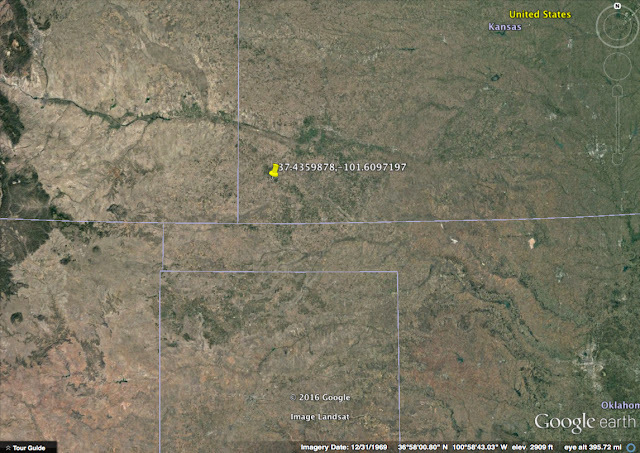 That seems obvious in retrospect, but it leaps out at you when you compare it with US fields. 2. Learn what tools are available to you... even more sophisticated ones. In this week, we see that some programming is incredibly handy to know. In truth, you didn't need to know much (other than copy-and-paste), but just have an inclination to tinker with the code to figure out what would work. In general, learning to code is a great thing to do, if only because you'll now know how to create your own tools (or at least, you'll know how to adapt the tools that are already out there for you). One obvious one in this category might be something to convert scanned text (e.g., text captured in a picture) into searchable text. You can imagine when such a thing would be handy. What other kinds of tools are out there like this? The more you know, the more robust your SearchResearch skills. 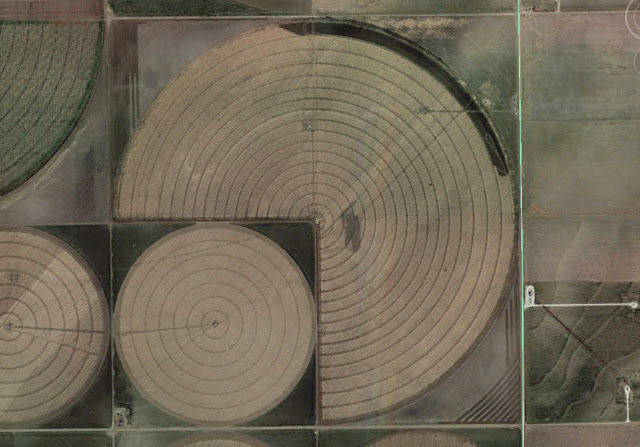 "Center-pivot irrigation was invented in 1940, in Strasburg, Colorado." Hello Dr. Russell. Very interesting and another surprise and learning. Window Seat, James W. Earl, UofOregon, English Prof.
"Norman MacLean says in A River Runs Through It, “All there is to thinking, is seeing something noticeable, which makes you see something you weren’t noticing, which makes you see something that isn’t even visible.” Not a bad description of the learning curve I’ve charted here, and not a bad definition of the sublime, either—a reserved, Midwestern definition of it, but not bad. MacLean learned it fly-fishing. I’ve been learning in my window seat." …I've been searching/learning/trying to notice/see in Dan's blog.